Colorado's unemployment rate has been below the national rate since 2012. As the Colorado economy has begun to outpace the national economy in recent years, this gap has grown. As of December 2015, the national unemployment rate was 4.8 percent, while it was 3.3 percent in Colorado. 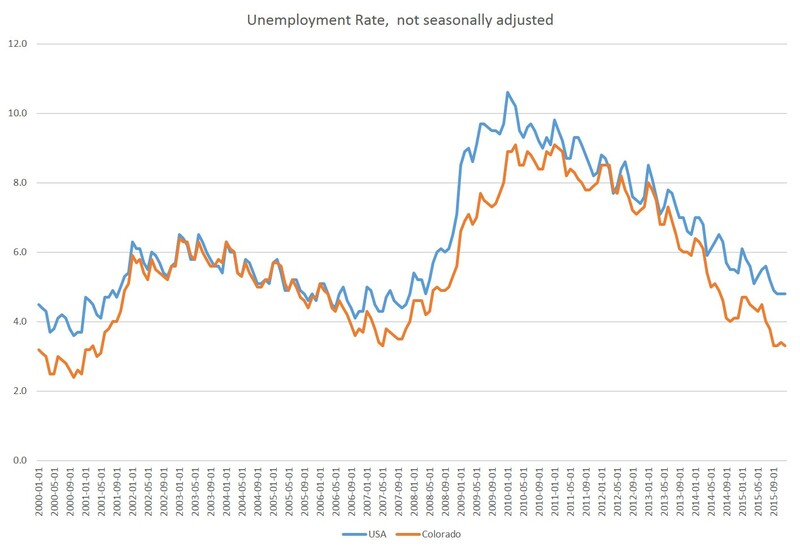 Indeed, unlike the US unemployment rate, the Colorado rate has returned to its pre-crisis levels last seen in 2007. Oil extraction activity has certainly been a factor here, and we have not yet seen any effects of closing oil operations as the price of oil has fallen. We may know more after we've seen February's employment data. How Colorado performs compared to the nation overall, and to other states will also continue to affect the decision of out-of-state residents to migrate to Colorado. As I noted here, Colorado has outpaced most states in in-migration in the past year.